January 5, 2011 – San Jose, California Edit Free Hot Water, a leading solar water heating manufacturer and distributor, has introduced new, easy-to-use solar thermal cost calculators and other estimation tools for estimating the size and project design of solar thermal systems. While there are many public solar photovoltaic (PV) calculators on the Internet, there are very few calculators tailored to the needs of solar water heating installers and consumers. All cost algorithms in the calculators are based on the latest published rebate data for all 50 states and updated as necessary. Of course, Free Hot Water’s registered installers and distributors receive substantial discounts off public retail pricing. 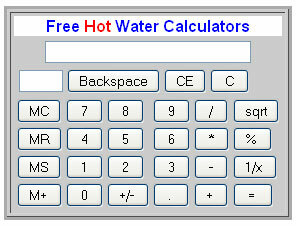 In addition to the new solar water heating cost calculator, Free Hot Water has also created public calculators to help its partner installers design their solar hot water systems.